The Abbott Power Plant on the University of Illinois campus in Champaign on March 6. The Illinois Environmental Protection Agency has slashed its staff almost in half over the past 15 years, resulting in less monitoring of environmental health and safety throughout the state. Overall, the number of full-time employees at the agency has dropped from 1,260 in 2002 to 635 last year, according to state records. The environmental agency has steadily lost manpower and support since former Gov. Rod Blagojevich took office in 2003, a review of state records by the Midwest Center for Investigative Reporting found. And since Gov. Bruce Rauner took office in January 2015, the agency has seen further cuts. The agency lost 190 full-time employees between July 2014 and December 2017. In addition, despite legislative approval to hire up to 768 employees, the agency still remains significantly understaffed. The Illinois Pollution Control Board handled 18 administrative citation cases in 2017, after handling 54 cases in 2014. Read more about the downturn here. 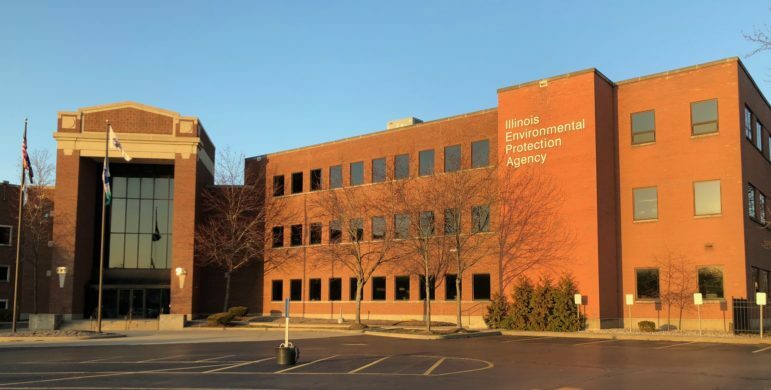 Illinois EPA Director Alec Messina said, over the years, the agency saw a significant increase in unfilled positions because as employees left, the agency did not attempt to hire replacements. The cuts have been across the agency and have largely been through attrition, such as retirements or staff leaving for other jobs. The Illinois EPA regulates clean air, water and land. The agency issues permits for businesses, inspects drinking water and wastewater facilities and mitigates ground pollution. 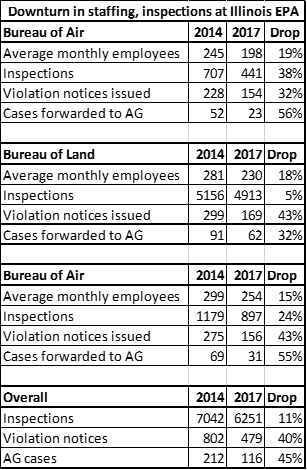 Since Rauner took office, the agency has conducted fewer inspections, issued significantly fewer violation notices and referred fewer cases to the attorney general’s office for enforcement. The Illinois Environmental Protection Agency headquarters in Springfield on April 7. Messina said that despite the downturn, the agency is still meeting its legislative mission. The agency, which has not received any general revenue fund money from the state government since 2011, is largely dependent on federal funding and permit fees for revenue. Although the agency does not receive state general revenue funds, it was still limited in its spending during the two years the state did not have budget. For example, in 2016 the agency spent only $221 million of the $365 million in revenues it received, and the agency stopped its household waste and tire collection events. The reductions under Rauner and Messina mirror what is happening at the federal level in the Trump administration and in other Midwest states, including Iowa, Indiana and Wisconsin. Alec Messina, the director of the Illinois Environmental Protection Agency. Messina was general counsel for the agency between 2005 and 2009 under Blagojevich. 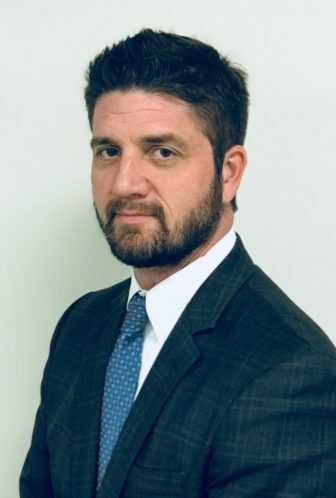 After leaving his state position, he served as executive director for the Illinois Environmental Regulatory Group, a trade organization for coal companies, power companies and industries subject to pollution regulations. He was appointed director of the Illinois EPA in 2016, where he makes a $133,000 a year. During an interview earlier this year, Messina was optimistic that the agency would be able to fill its empty positions. However, the Illinois Comptroller’s Office announced in February that the General Assembly had authorized sweeping more than $5.5 million from the Illinois EPA into the General Revenue Fund, as well as borrowing $53 million from the agency’s underground storage tank fund. “These actions taken by the General Assembly and Comptroller’s Office are definitely impediments to increasing headcount at the agency,” Messina said. Messina said the agency’s staffing issues started because the agency did not post jobs as employees left. For example, when 31 employees left in 2009, only eight jobs were posted, he said. In 2010, when 45 employees left, the agency only posted one job, he said. “Hiring is critical, and you have to be really aggressive in posting these jobs,” Messina said. In 2017, the agency posted 106 jobs - an effort to boost staffing levels to nearly 770 people. “Just because we post 106 jobs, more than double the number of postings in each of the last six years, doesn't mean we get 106 new people off the street,” Messina said. Messina said many of the jobs are filled through interagency transfers. He also said the agency has struggled to find qualified applicants. Environmental advocates argue the lack of staffing continues to hurt the state. “Without an active enforcement regime and the employees that actually carry that out, it’s a very big state and we can’t expect that fewer people can simply absorb the workload,” said Carol Hays, executive director of Prairie Rivers Network, a nonprofit organization that advocates for clean water in Illinois. 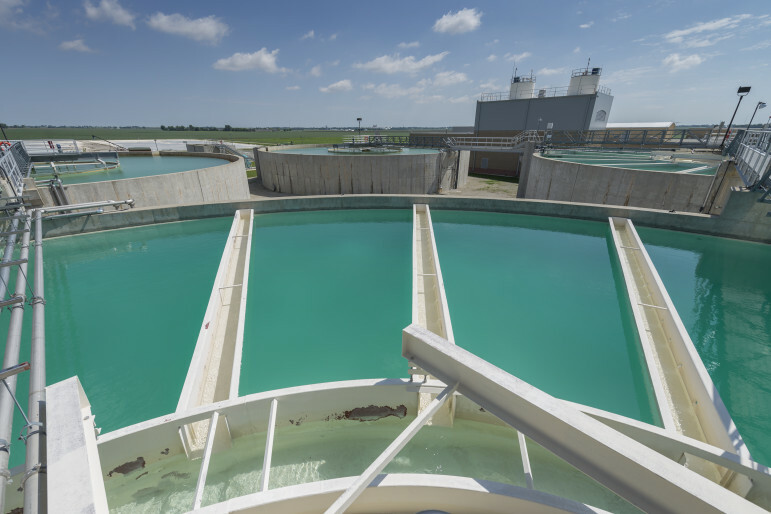 A settlement basin in the first treatment steps at the Illinois American water plant west of Champaign on June 3, 2014. As employment levels declined under Rauner, the agency’s air, land and water bureaus also decreased their enforcement, according to a comparison of agency records between Fiscal Year 2014 – the last full year before Rauner took office – and Fiscal Year 2017. The state’s fiscal year runs from July 1 to June 30 of the following year. Air, water and land inspections of facilities dropped from 7,042 to 6,251, or 11 percent. Violation notices from those inspections dropped from 802 to 479, or 40 percent. Cases referred to the attorney general’s office dropped from 212 to 116, or 45 percent. Messina said the downturn in inspections can be traced to fewer pollution sources. He said that past administrations have focused on smaller cases, such as littering, so one reason for fewer violations may be because the state is letting local governments handle smaller cases. Messina also said the water loan programs, which provide money to local governments, have grown. The loan programs improve infrastructure for drinking water and wastewater facilities. But environmental groups stressed the agency must do more. 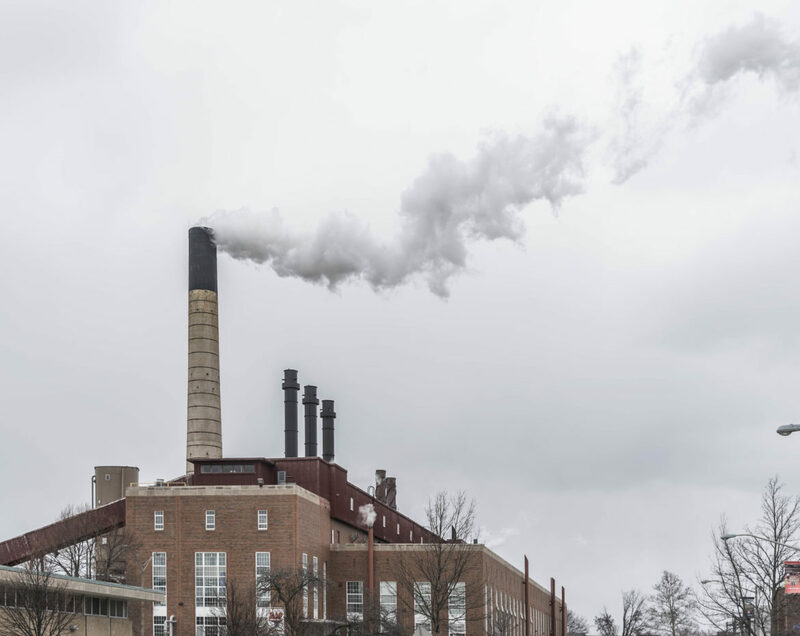 Brian Urbaszewski, director of environmental health at the Respiratory Health Association of Metropolitan Chicago, said the state government seems to be following the same blueprint as the federal government under Trump in reducing staff and enforcement. “There’s not much difference right now between what’s going on in the Trump administration and what’s going on in the Rauner administration,” Urbaszewski said.